The longhorned or bush tick. 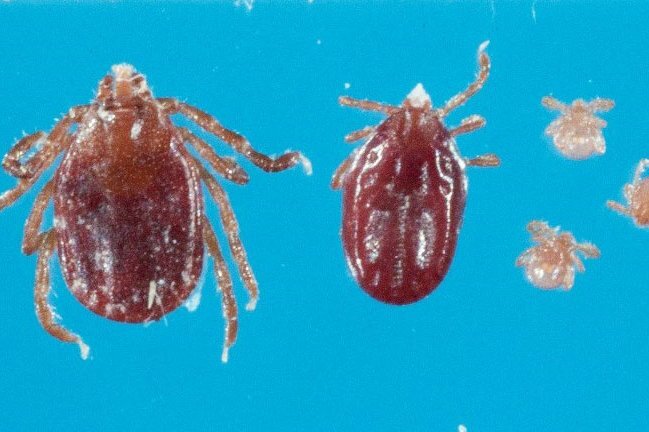 New Jersey officials have found an "exotic" East Asian tick in the state that could be a threat to livestock, pets and humans. The state's department of agriculture said Tuesday they discovered the tick, known as the longhorned tick or bush tick, on a farm in Hunterdon County on Nov. 9. The tick isn't native to the United States, but the species has been found on animals and materials presented for entry into the country in the past. The species are dark brown and small, only getting to the size of a pea when fully engorged. According to officials, the tick is a "serious pest to livestock," particularly in New Zealand. While the Hunterdon farm has been treated to eliminate the species, New Jersey farmers are being asked to be on the lookout for decreased growth rates or signs of anemia in the animals. The species is known to cause Theileriosis in cattle, a disease that can lead to severe anemia and even death. While Theileriosis does cause any food safety or human health risks, the ticks could cause the spread of other bacterial and viral diseases in humans and animals. Agriculture officials are currently investigating whether the locally found ticks are carrying any pathogens that may impact human or animal health. • Knowing where ticks are: ticks can live in or near wooded or grassy areas or on animals directly. • Using repellent on skin: use EPA-registered insect repellents containing DEET, picaridin, IR3535, oil of lemon eucalyptus, para-menthane-diol, or 2-undecanone. Always follow product instructions. • Treating clothing, boots and camping gear with permethrin. • Covering up by wearing long sleeves and pants when spending time outdoors and consider tucking pants into socks to prevent ticks from getting under clothes. • Showering as soon as possible after coming indoors to remove unattached ticks. • Inspecting your body for ticks and removing ticks immediately. • Treating your pets with veterinarian-approved products to kill or repel ticks. Products are available for domestic animals like dogs and cats, as well as for animals like sheep, goats and cattle. Officials are still monitoring the situation. If the tick is detected in wildlife, officials ask residents to call the NJ Division of Fish and Wildlife, Bureau of Wildlife Management at 609-984-6295 or the Office of Fish and Wildlife Health and Forensics at 908-637-4173 ext. 120. Questions about livestock should be directed to the state veterinarian at 609-671-6400, and questions about tickborne illnesses should be directed to the New Jersey Department of Health at 609-826-5964.